Hinduism is diverse; no single doctrine (or set of beliefs) can represent its numerous traditions. Nonetheless, the various schools share several basic concepts, which help us to understand how most Hindus see and respond to the world. The concepts we discuss here are largely based on Siddhanta and Vedanta, and accepted by most modern traditions (but, keep in mind, not all!). the Supreme Self, or God (the paramatman). 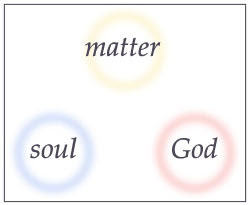 Hence, there are these three main truths (see below), which form the basis for theological discussion. These three truths have been expanded in this section into twelve concepts. These twelve are interwoven into a useful overview of Hindu thought (given below). This simple diagram shows the three basic concepts that form the basis for Hindu thought. Different schools present various opinions on the nature of each "concept" and the relationships between them. Almost all Hindus believe that the real self (atman) is distinct from the temporary body made of matter (prakriti). The eternal soul identifies with matter and is entrapped by maya (illusion). Impelled by lust, greed, anger, etc., he undergoes samsara (the cycle of repeated birth and death). Each soul creates its unique destiny according to the law of karma (the universal law of action and reaction). Under the influence of eternal time and the three gunas (material qualities) he moves throughout the creation, sometimes going to higher planets, sometimes moving in human society, and at other times entering the lower species. The goal of most Hindus is moksha, liberation from this perpetual cycle, through re-identification with the eternal brahman (Supreme). Hinduism accepts different paths towards this common goal (union with God). Nonetheless, it stresses strict adherence to universal principles through the practice of one's dharma (ordained duty) as revealed through authorised holy books and usually received through the guru (spiritual mentor). 1. Who are we? What is the real self? 2. What happens after death, before birth? 3. Why is there suffering? 4. How does the world work? 6. What is the goal of life? 7. Is there a God? If so, what is He/She like? 8. Which is the right way to act? 9. How can we explain Hindu diversity? 10.How are the teachings preserved? 12.How and why was this world made?